I try to use my slow cooker as much as I can. It doesn't always happen. I use it once or twice a week right now and lately my family's favorite recipe has been these Slow Cooker Chicken Tacos. Cook the taco meat in a slow cooker (a.k.a. a crockpot), have the kids help set out all the other ingredients, and boom - dinner is ready. This recipe comes via Six Sisters Stuff and it's really good. I'm talking really really good. 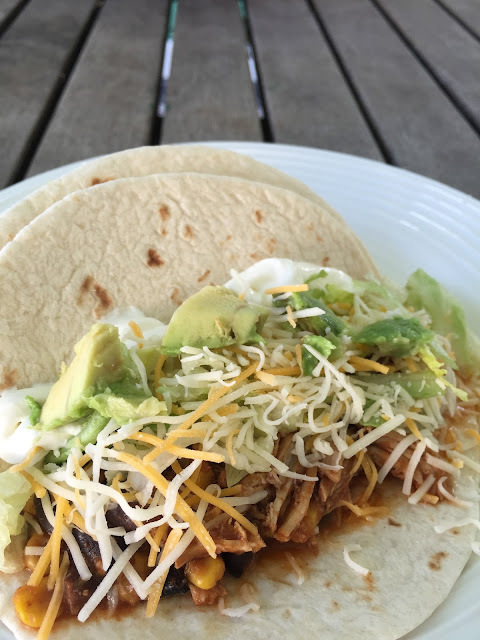 I love this chicken taco recipe because not only does it taste fabulous, but it is versatile and customizable. You can serve it as tacos, over tortilla chips or make a taco salad with it. It only requires a few ingredients, you can make it organic. On SSS, it's in a post about freezer meals. While I think you could also make this as a freezer meal, it has you thaw it out ahead of time and that never works well for me...thawing slow cooker recipes out in my fridge I mean. So, I put it straight in the slow cooker. Make sure to head over to Six Sister's Stuff for the recipe. 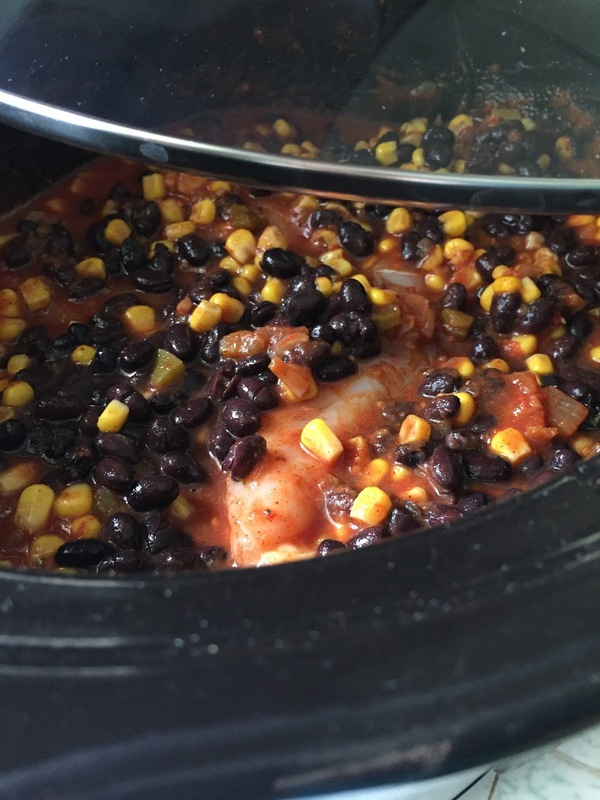 You can pin the slow cooker salsa, corn, and black bean chicken recipe here. (I pinned from Six Sister's Stuff to give them proper credit). If you don't like beans and/or corn - I have left them out and it tastes great. I've also used half of the beans and corn the recipe called for and swapped the added water for more salsa. Who doesn't love more salsa? It calls for taco seasoning...I'm looking forward to trying this homemade taco seasoning and making in bulk to have on hand so I can satisfy my chicken taco cravings. Don't have a slow cooker? Forgot to start the recipe 5 hours ago? No problem! I made a similar recipe in the oven last week when I was craving these yummy tacos but forgot to put the meat in the crockpot. I did have one jar of salsa and packet of taco seasoning...Mix together and pour over chicken breasts layed out in a 8x8 baking dish. Cover and bake in the oven at 350 degrees for 40-45 minutes. Shred chicken with a fork and serve.